Exquisite ocean view! 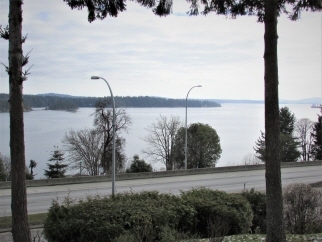 2 Bedroom/2 Bath Condo located in the highly desirable “The Lookout” This main level entry, single floor unit is move in ready and offers approx. 1351 sqft. You will be captivated by the unparalleled views of the Ladysmith Harbour, Gulf Islands, Coastal Mountains and Transfer Beach from the living room or balcony. Many upgrades including Maple Sierra Engineered hardwood floor in the livingroom/dinning room and bedroom floors and custom blinds. Living area is warmed by a natural gas fireplace. Master Bath presents a walk-in shower and generous master suite provides a 4-piece ensuite. Ideally located within walking distance to the historical Town of Ladysmith and the multitude of amenities the town has to offer. Unit enjoys its own single garage and low maintenance living!